The Oklahoma Heart Gallery will be available for viewing in the Ponca City Library through Sept. 7. The exhibit is in conjunction with the Riders on the Orphan Train presentation at the Library at 7 p.m. Sept. 4. In 2001, the first Heart Gallery was organized in Santa Fe, N.M. The idea was simple: To have talented photographers create inspiring portraits of children and sibling groups who were waiting for adoption. By sharing the portraits in the community, founder Diane Granito hoped to build awareness and create more opportunities for adoption. The first Heart Gallery exhibit was an exciting success, attracting more than 1,200 visitors and facilitating the adoption of six waiting children. 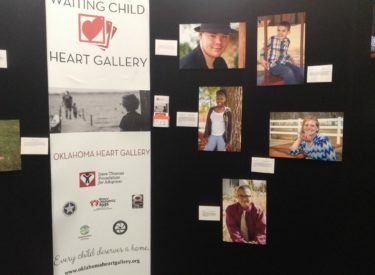 The mission of the Waiting Child Heart Gallery of Oklahoma is to use the power of photography to raise awareness, inspire communities, and recruit adoptive families for Oklahoma’s waiting children.